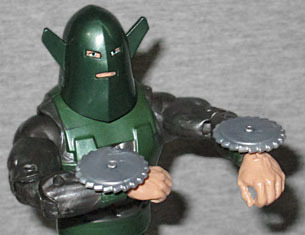 If Marvel Legends had action features, this toy would be spinning like Sy-Klone. Unnaturally strong and relentlessly brutal, these harbingers of destruction are bad to the core. Originally known as the Human Top, David Cannon is a mutant with the ability to spin his body at great speeds. Which may not sound like the greatest power ever, but once again reminds us that it was easy for a mutant to survive M-Day if nobody remembered where their powers came from. He considers Wasp his arch-enemy (he makes prostitutes dress up like her, then beats them up), but for years he posed as Janet Van Dyne's chauffeur without anyone in the Avengers realizing it. 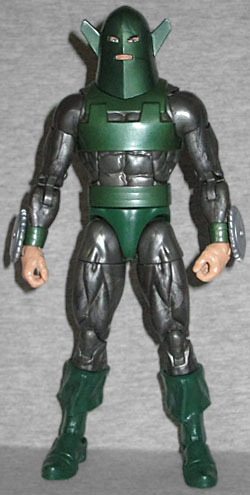 He was a member of Ultron's incarnation of the Masters of Evil (and several later versions as well). In fact, more of his time is spent in unsuccessful villain team-ups than as a solo threat. Whirlwind has worn several terrible costumes, especially in the past few years as artists keep coming up with worse and worse redesigns (seriously, in the last decade or so he's looked like garbage), but this is the classic. Yes, even with that stupid bullet-shaped helmet with the little flat wings sticking out of the ears, this is his best look (which should give you an idea of how bad his other designs have been). 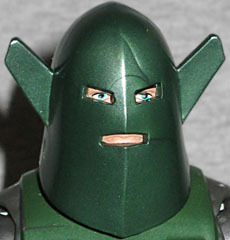 The helmet has three slits in it: two for the eyes and one for the mouth, and they're all completely sculpted and painted within there. This is actually Whirlwind's second costume; the first was basically the same, but everywhere this one is grey the original had bare skin. Guess he decided that a little extra protection wouldn't go wrong. The grey should really be textured - in the comics, it's chainmail or some other kind of armor - but here it's just the usual medium body limbs (with Cap's boots). 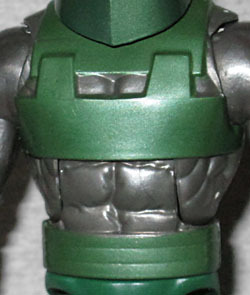 The torso is a new piece, with Whirlwind's distinctive green harness thing sculpted on the upper torso, and his banded belt sculpted on the lower torso. Those possibly could have been done with paint, but sculpting them is a much better choice for the toy. At the same time he picked up the chainmail, Whirlwind added a pair of 10" circular saw blades to his wrists. Well, the Tinkerer is the one who actually did the work, but you know what we mean. The figure's forearms are new, with sculpted bands to match his belt, and pegs where the sawblades attach. Given those pieces and the recent premiere of Daredevil Season 2, I wouldn't be too surprised to see a Gladiator figure in the not-too-distant future. Whirlwind has all the usual ML articulation, plus his sawblades can turn. The shape of his helmet does limit his head quite a bit, but blame that on the comics. Both these "Forces of Evil" figures come with one of the arms for the Red Onslaught Build-A-Figure: Whirlwind has the left arm, while Cottonmouth has the right. If they both had the same piece, you'd have to reload this page to read about the other character. Whirlwind may not be the most effective villain the Avengers have ever faced, but he's a classic foe and deserves a modern action figure.